The Slooh online telescope service is opening its telescope feeds to the public on Aug. 7, 2017. The company offers feeds from remotely operated telescopes Chile and the Canary Islands, as well as from 25 partner telescopes around the world. If you're itching to watch a telescope at work, you can now do it for free thanks to astronomy broadcasting service Slooh. As the 14-year-old service gears up for a live partial lunar eclipse event today (Aug. 7), Slooh announced its live telescope feeds will be opened to the public for free at all times, instead of just during certain broadcasts. The feeds used to be behind a subscription paywall for paying members only at Slooh.com. 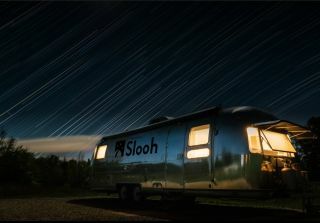 "It allows people to watch without them having to have any preconceived desire or knowledge to pull out a credit card and say, 'I want this'," said Michael Paolucci, founder of Slooh, in an interview with Space.com. The new initiative allows everyone to watch the live feeds, instead of just paying members. However, you will still have to pay if you want to control Slooh's telescopes. "Apprentice" members have limited observations of 500 popular objects in the night sky (allowing for easy telescope targeting), while "Astronomer" members are for people used to working with professional telescopes, and who are interested in more obscure objects. "Slooh members get to make astronomical observations just as professional astronomers do today, using the same kind of equipment, from some of the same observatory locations." said Paige Godfrey, Slooh's director of research, in a statement. "The public have never before had the opportunity to do astronomy this way." Slooh also announced it would have a show at 11:45 a.m. EDT (1545 GMT) today to look at a partial lunar eclipse. This eclipse happens only two weeks before the total solar eclipse of Aug. 21 will cross the United States. The lunar eclipse show can be viewed live on the Slooh website. Viewers can take part on Twitter by tagging @Slooh. The webcast will also be available here at Space.com, courtesy of Slooh. "Every total solar eclipse brings with it a lunar eclipse either two weeks before or after," said Slooh Astronomer Paul Cox in the same statement. "While it may not be as dramatic, it's a wonderful opportunity to build understanding of eclipses, in anticipation of the big one to follow." The Slooh show will include several live streams of the eclipse from partner observatories in Africa, the far East and Australia. Special guests (who had not been finalized by press time) will also take part. Slooh will also provide details soon about how members can take part in a weekend in Idaho celebrating the total solar eclipse. That event, Slooh's Transcontinental Road Trip, runs from Aug. 18 through the total solar eclipse and ends Aug. 22.